Babes who else loves a good trend? This spring I am so excited to share one of the best trends for spring: ruffles! Today I am sharing my top favorite ways to incorporate this gorgeous trend for spring. 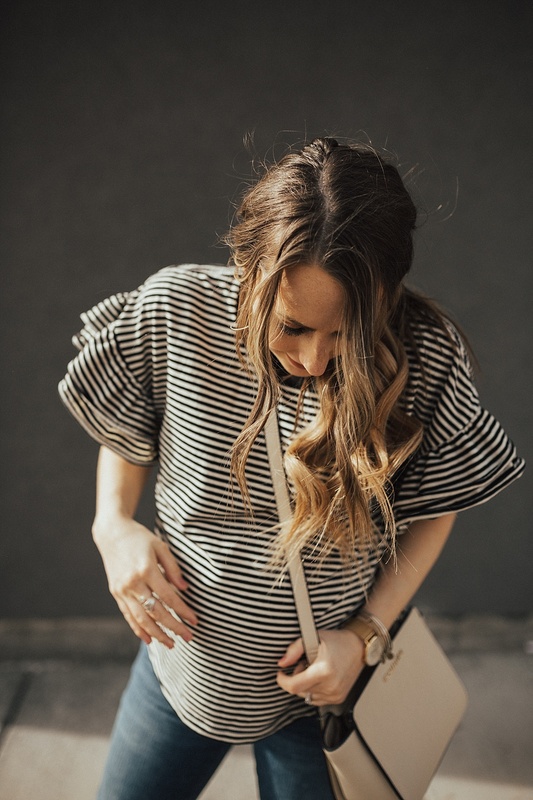 Where I am having this baby in the next 7-8 weeks I have started looking at shirts that don’t have to fit a quickly growing basketball under them. There is a whole world of possibilities when you don’t have to look at tops thinking “hmmm can I squeeze my belly into that without the bottom hanging out” ha. Something that I have really noticed that is a huge trend for this spring is ruffle sleeved tops. I have to say I’m obsessed. 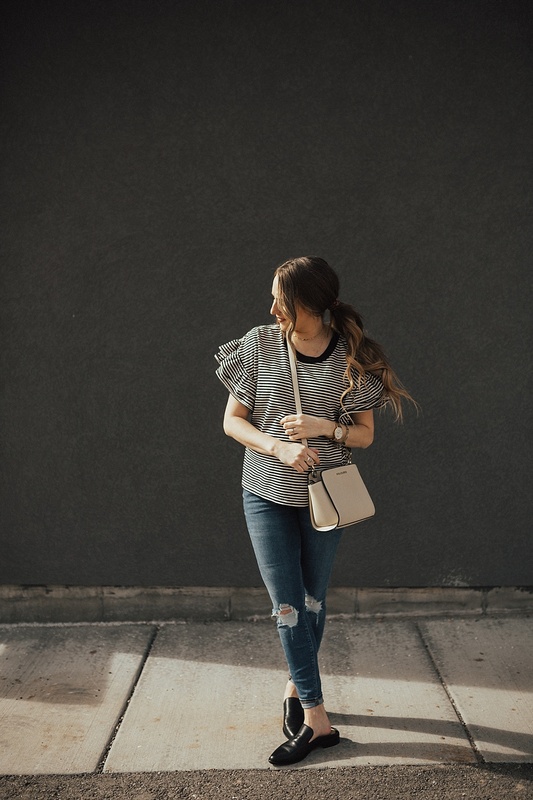 I love that it feels like you are wearing a basic tee, but the sleeve detail of the ruffles gives such a statement without layering or wearing anything different. 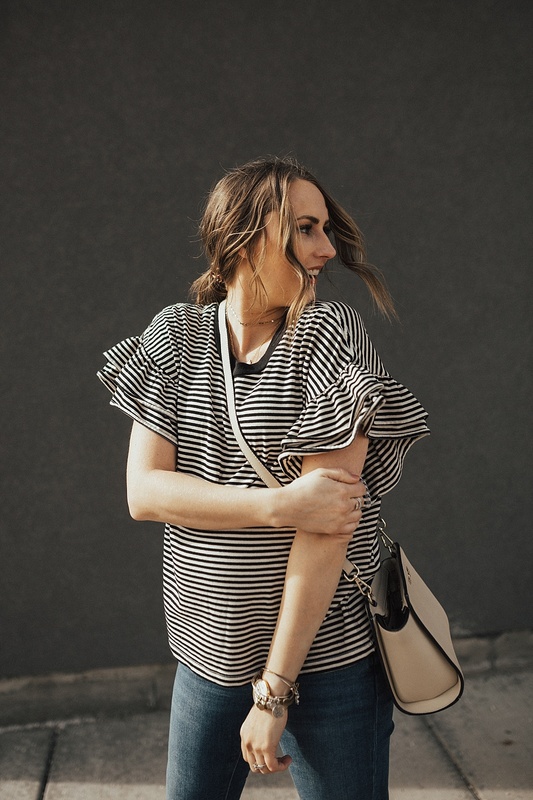 There are so many different types of ruffle sleeved tops, everything from prints to solids, long sleeved and short sleeved, and everything in between. 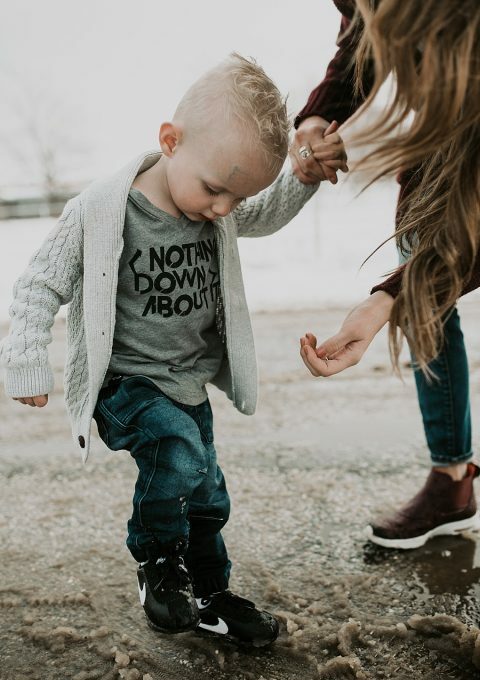 I am excited to share with you how I am going to style them as soon as baby sister gets here and even now! 1 – Keep it simple. 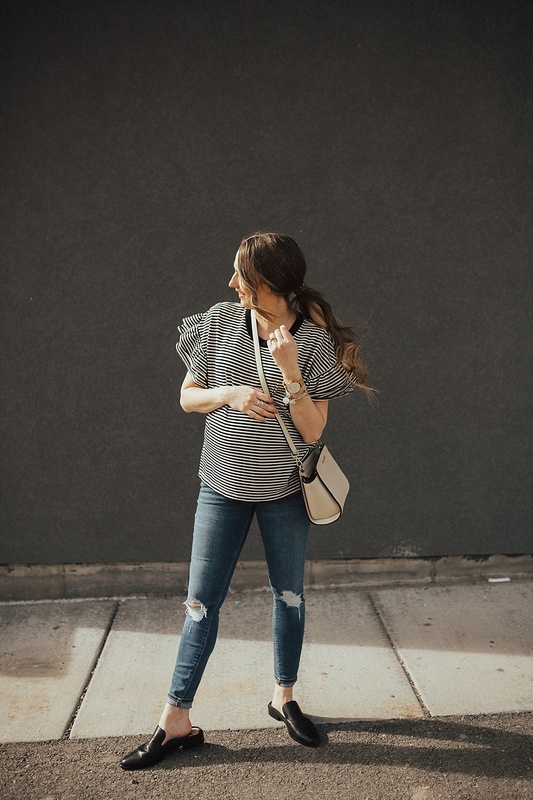 If you ask me a ruffle sleeved basic tee is the perfect momiform. 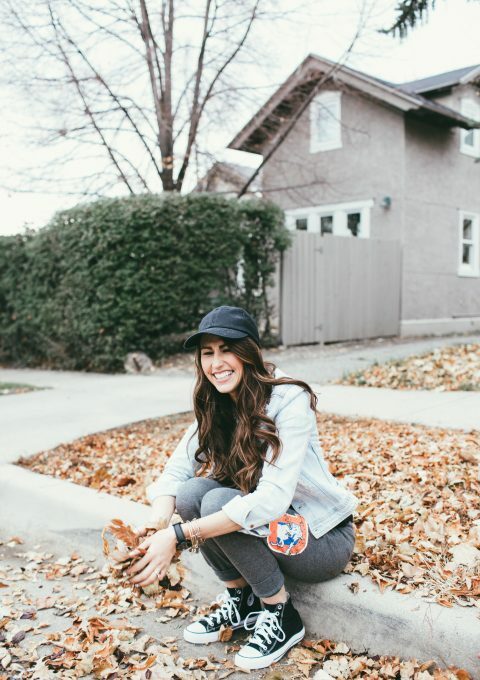 You look put together, you can put it on with jeans and some flats, but it looks like you put so much more into your outfit because of the sleeve detail. I also love that it looks darling with my hair thrown up in a ponytail or in a top knot because there is detail at my shoulders. 2 – Tuck them into a skirt. This is what I can’t wait to do for dressing up as soon as this bump is in my arms. Tucking your ruffle sleeved tee into a simple pencil skirt is the perfect thing to add a statement to a basic skirt but also not put too much thought or effort into it on your part. 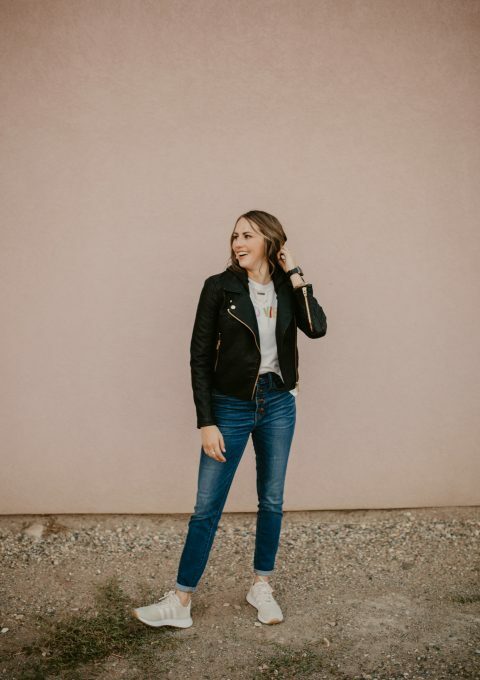 If you want to wear it super casual you can wear it with sneakers, and if you need to dress it up you can pair it with some heels and a crossbody bag. 3 – Accessorize simply. I am a girl who loves to wear accessories, when wearing accessories with a ruffle sleeved tee keep them simple and dainty. You don’t want to have too much going on with the statement of the tee that is already there. 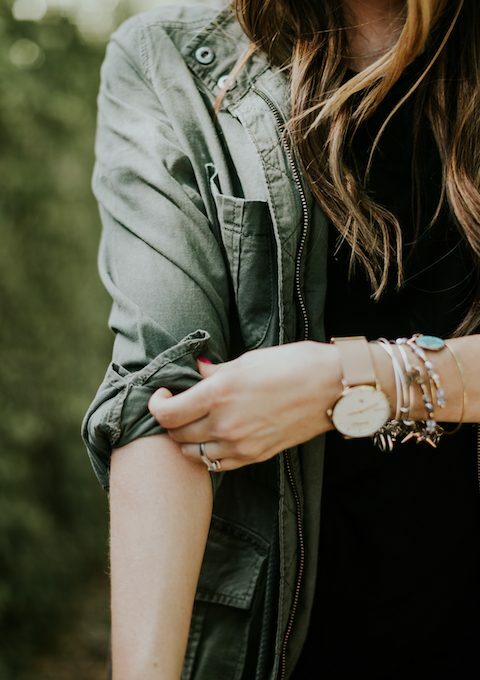 4 – Wear layered over a dress and tied in a knot. Layering dresses is going to be my jam both before and after I have the baby. I love the look it gives. 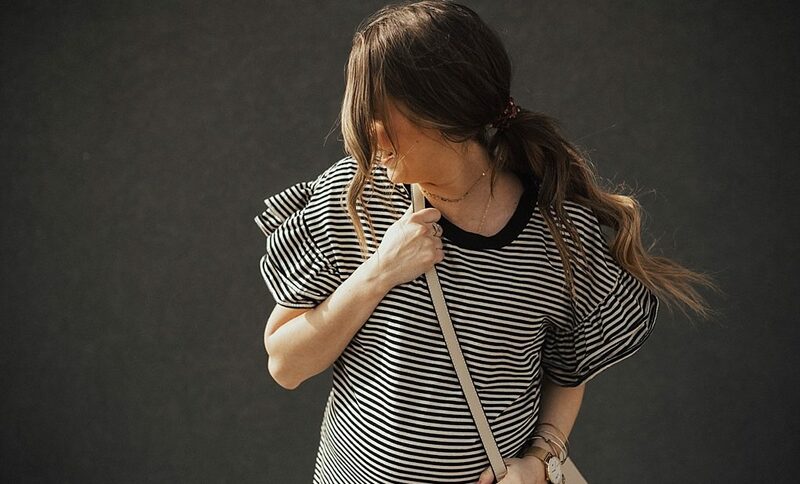 Layering a ruffle tee over a simple bodycon dress gives it more texture and then you can pair with sneakers and run errands or take your littles to the park! 5 – Pair with bermuda shorts. Bermuda shorts are a huge trend for spring and summer. As soon as the weather gets warm wear your ruffle sleeve tee with some bermuda shorts and sneakers or sandals and girl you’ll be looking good! 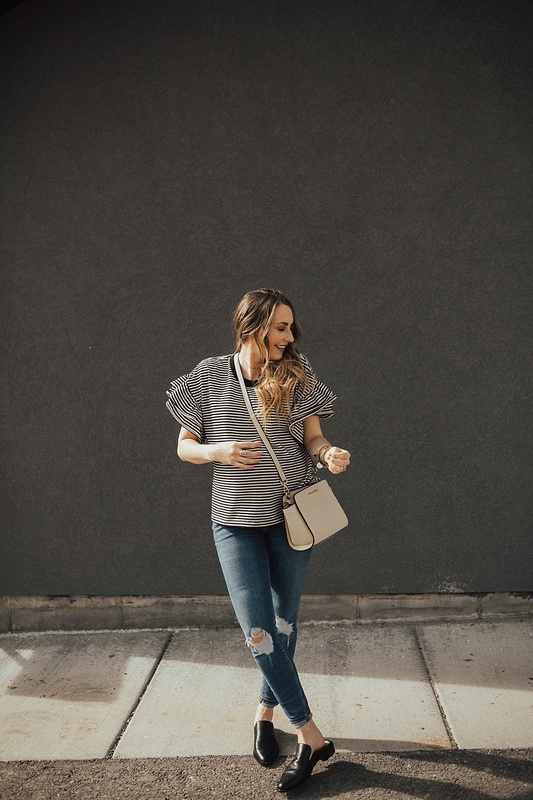 I hope this helps you to know what to wear with your ruffle sleeve tee and if you have been hesitant to snag one that it gives you the little push you need to wear and rock the trend!